Any visit to Fattoria Mani di Luna just south of Perugia is a foot stomping time and a true learning experience. 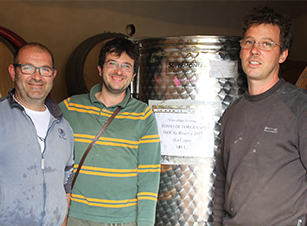 On my first visit best friends and co-owners Rocco, Simone and Alessandro, who created the winery in 2012, made me feel like an old friend and schooled me on the reasons why they produce biodynamic wine. My visit was the most memorable in day scouring the Umbrian countryside looking for pure Sangiovese from this underappreciated region like I did so many times as a tourist when I lived in Rome. These three friends go way back. Alessandro and Rocco played in a band together for years (although they claim they are all washed up they still play!). Rocco and Simone were classmates in Perugia studying agronomy. Rocco in the end is the enologist, eventually receiving a further degree. They came together to produce their first experimental wine in 2010 on their 7 hectares located in the town of Torgiano. In 2012 they officially became a winery. The property was in the hands of the Lungarotti family for years, who have one of the more famous wineries in the region, before the three friends took it over. The property is located at the confluence of the Chiascio and Tevere (which flows through Rome) Rivers with the low lying vineyards at 200 meters and two detaches sites just up the hill from the winery at 400 meters. In total they have 35 hectares, many of which are planted to olives, cherries and other fruits which the Lungarotti family took pride in when they owned the property. 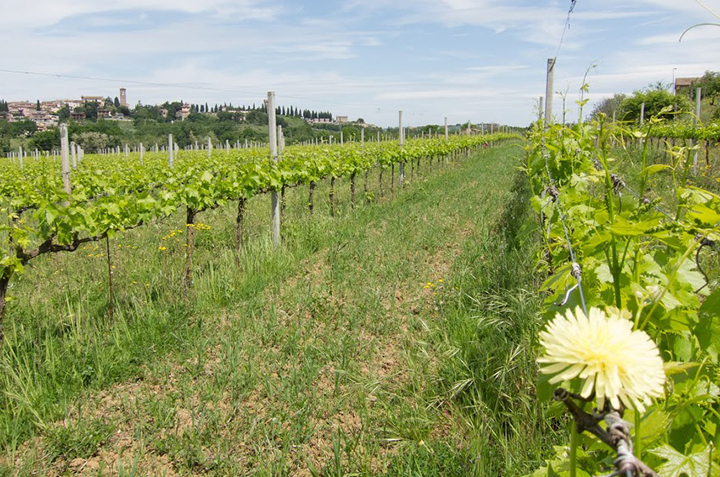 In Torgiano you have sandy soils full of minerals and sediment left behind by the ancient lake Tiberinum. The property is broken down into three parcels, the first of which surround the winery in some of the sandiest soils. 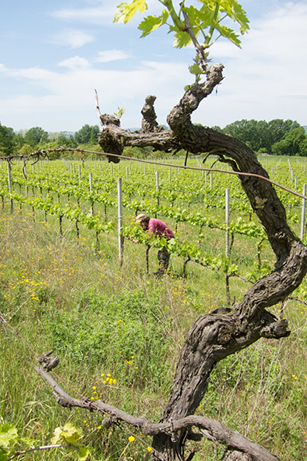 Here you find some of the oldest vines of Trebbiano, Grechetto, and Riesling. Many of the vines were planted by the three friends around 2008 which is the case for the two parcels (called Il Baratto and Montestanto) which are planted to Sangiovese Grosso, Sagrantino and on the white side Trebbiano, Grechetto, and Malvasia. Within these parcels the soil can range from these high concentrations of sand to swaths of clay and the guys chose strategically where to plant each vine based on the changing terroir. 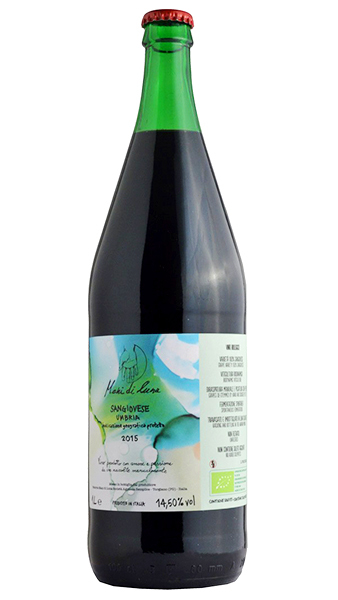 Mani di Luna (which literally translates to hands of the moon) has been biodynamic since 2012 when they produced their first wine. They follow Maria Thun’s biodynamic character and follow the cycles of the moon for the work they do both in the vineyard and the cellar. Beyond using the biodynamic compost 500 and 501, Mani di Luna uses herbal teas that they have created to treat their vines. When it comes to the wines themselves everything is done the old fashion way, with wines foot stomped, fermentations natural and wines bottled on the waning moon. By hand of course! None of the wines are filtered and the wines are bottled “per caduta” meaning as a result of natural separation of liquid and solid. With all this said there is an incredible purity of fruit with these wines that will make a believer out of the anyone skeptical about the natural wine movement! 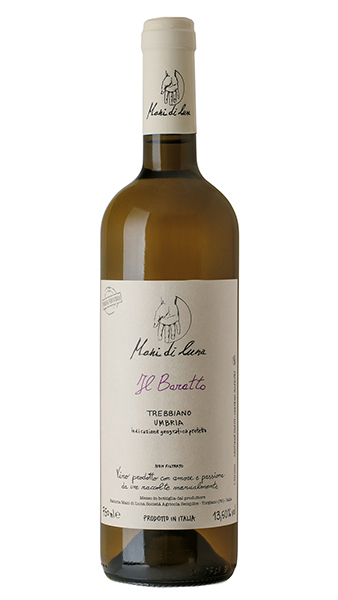 A field blend of sorts from Mani di Luna’s Baratto vineyard, a 40 year old vineyard sight full of mineral and sandy soil. The wine has some sapidity to it, thanks to a later September harvest, warm vintage, and about 2-3 weeks of skin contact during fermentation. Notes of pear, apple, white folowers, and a bit of tannin from the skins. Organic and biodynamic practices over the course of the year, including harvesting based on moon phases. The whole clusters are pressed by female feet (for gentler pressing) in an ancient vertical press, with fermentation occurring for 2-3 weeks in stainless steel. Aging is for about 6-7 months in stainless, bottling in waning moon without filtration or fining. Considering this wine is made of such bold red grapes, it is no surprise that this is one of the more structured roses we have tasted. 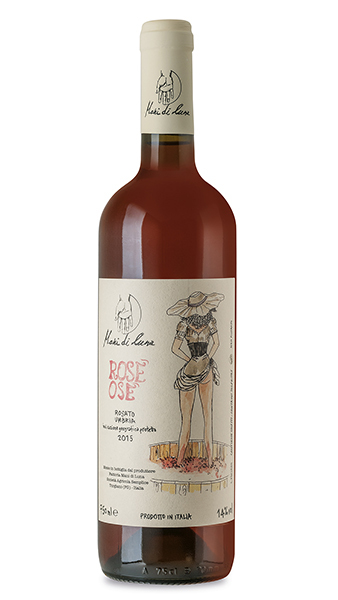 Aromas of orange blossom, blackberry, wild strawberry, a full but surprisingly energetic and aromatic rose. Grapes are harvested and whole clusters are pressed by feet in stainless steel tanks. Fermentation occurs without temperature control for about 2-3 weeks, followed by 6 months on the fine lees. Bottling occurs in the following May, without filtration. 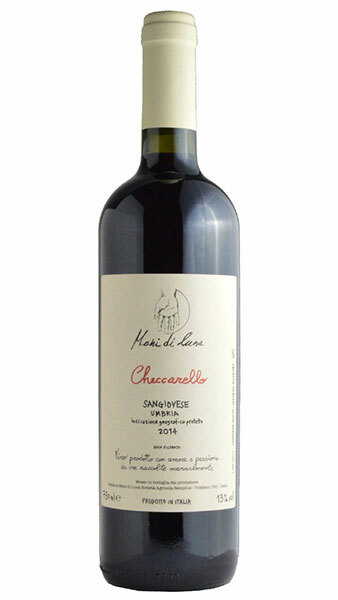 Juicy, fresh and fun this liter of Sangiovese is a fun take on this serious varietals. The idea behind the liter format is that this is an upretentious wine to drink with friends and family. Once you pop it you won’t stop! Have no fear the bottle will be gone before you know it! This wine pairs with so many different foods. From meats and cheeses, to mushroom risotto or fish stew. There’s an earthy undertone that you can play off in terms of pairing but this wine will surprise with how versatile it is for a Sangiovese. Foot press followed by just 5 days of maceration and a natural ferment. The wine eventually ages in cement and will be bottled in April, just a short 6/7 months after harvest. Sangiovese with a touch of the feminine Barbera helps give this wine velvety tannins and a softer side. The Barbera comes from a small portion of the property planted in the 60s! With the acid from the Barbera this wine is great for charcuterie. Also try this with pasta and fagioli, ragu, and braised meats. Foot press that results in a bit of carbonic maceration with some grapes missing out on a proper squeeze. The wine ferments, without temperature control, in both stainless steel and cement. 15 days of skin contact. The wine ages in stainless steel for nine months on the fine lees, with continuous battonage. It will then be racked off the lees and bottled shortly after without being filtered. 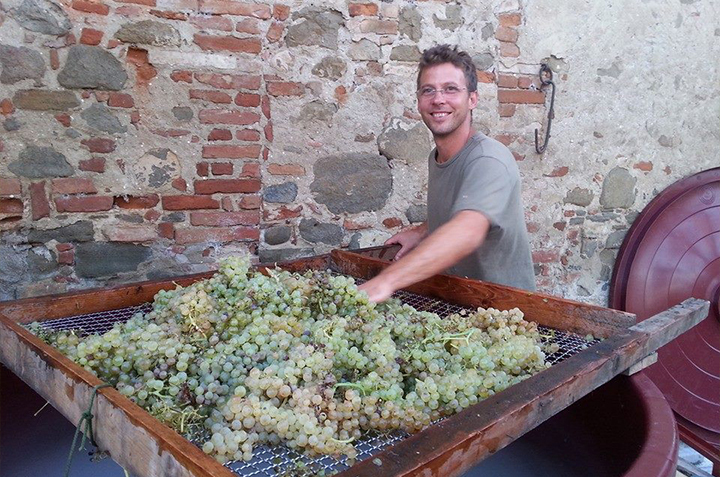 Watch how Fattoria Mani di Luna stomps their grapes!